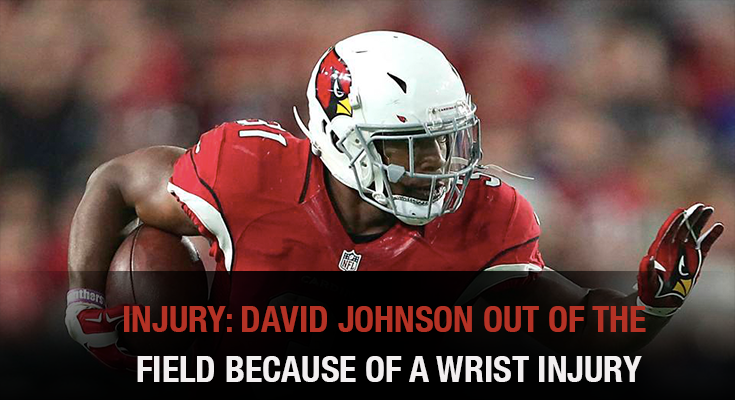 On Monday, the Arizona Cardinals reported their player David Johnson could be having a surgery on the coming days. He is suffering of an injury on the wrist. The news were confirmed by an ESPN corresponsal who explained the different opinions around the player’s situation. There had been some arguments between the doctors, as some of them want to continue with a surgery, but other don’t. The final decision will be took in a maximum of 48 hours. The team will have to take a decision about the player’s current situation as soon as possible. The injury will take the player out of the field for 4 weeks approximately. Many correspondents have gave their opinion on their articles. One for the NFL said that Johnson’s surgery can be the better option, because if they don’t do it the player could suffer for a long period of time. The alarms were turned on when the results of Monday’s MRI showed an unfavorable view for the player’s future. After it happened, Johnson was diagnosed with a sprained wrist but results showed other thing. The news about the results were announced by the head coach Bruce Arians. He told the reporters that the injury was as serious as the one suffered by T.J. Logan some months before. Logan stayed out of the field for 12 weeks because of the same injury. Everything happened on the third quarter on the game against the Detroit Lions. Unfortunately, it was the first game of the season. The player fumbled on the 24-yard carry and missed the marked. The game finished with a terrible 35-23 loss for the Cardinals. Johnson was replaced by Kerwynn Williams on the field. Hopefully, the team will take a quick decision that can take back the running back soon.